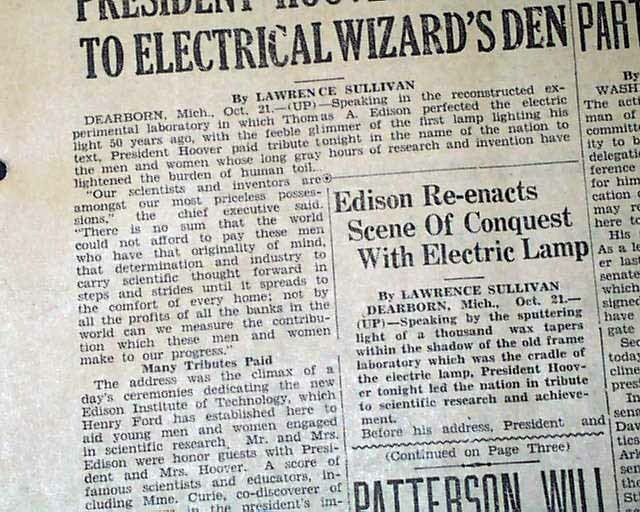 This 8 page newspaper has a two column headline on the front page: "THOMAS EDISON HONORED BY PRESIDENT HOOVER'S VISIT TO ELECTRICAL WIZARD'S DEN"
1st report coverage on the dedication of the Edison Institute in Dearborn MI Michigan. 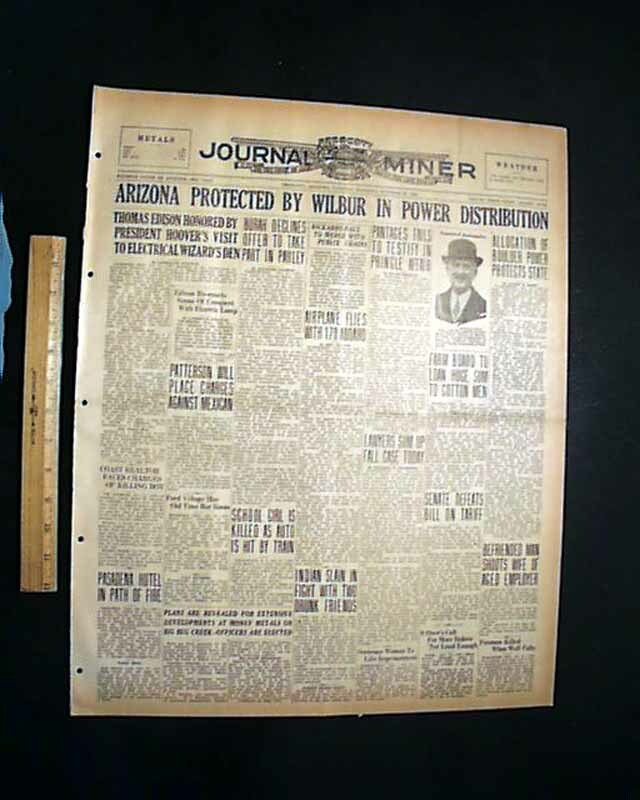 The great stock market crash of 1929 was just a few days away. Other news, sports and advertisements. Light browning, a little margin wear, otherwise good. 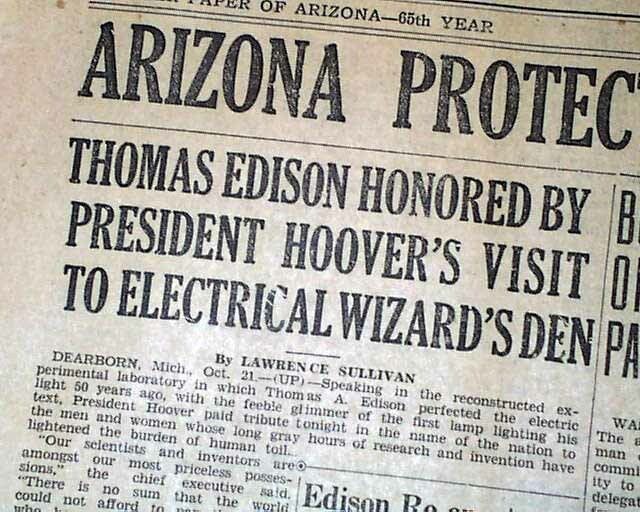 wikipedia notes: The Edison Institute was dedicated by President Herbert Hoover to Ford's longtime friend Thomas Edison on October 21, 1929 – the 50th anniversary of the invention of the incandescent light bulb. Of the 260 people in attendance, some of the more famous were Marie Curie, George Eastman, John D. Rockefeller, Will Rogers, and Orville Wright. 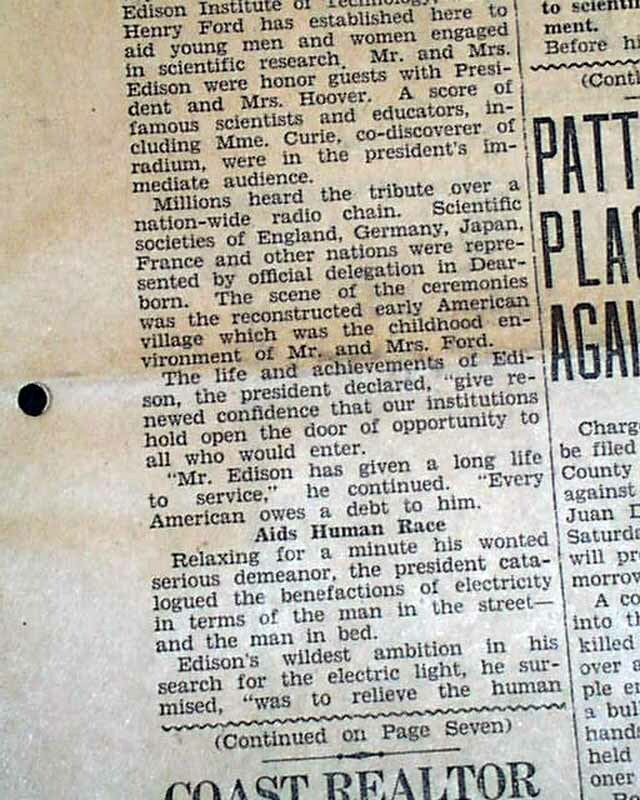 The dedication was carried on radio with listeners encouraged to turn off their electric lights until the switch was flipped at the Museum. The Edison Institute was originally composed of the Henry Ford Museum, Greenfield Village, and the Greenfield Village Schools (an experimental learning facility). Initially, Greenfield Village and the Henry Ford Museum were owned by the Ford Motor Company which cooperates with the Henry Ford to provide the Ford Rouge Factory Tour and is a sponsor of the school. The Henry Ford is sited between the Ford Dearborn test track and several Ford engineering buildings with which it shares the same style gates and brick fences.